Luther Women's Tennis team celebrates a successful end to their fall season. 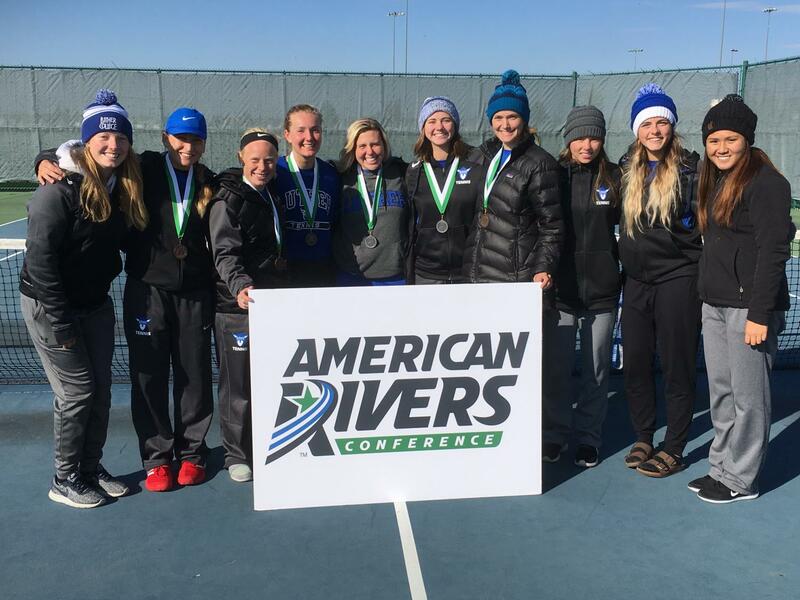 Luther Women’s Tennis took on the American Rivers Conference Individual Tournament on Oct. 12 and Oct. 13 in Ankeny, Iowa. The team completed their final matches of the season, bringing back three third place wins, a second place win in A-Doubles, and a first place win in the C-Singles bracket. After the first day of competition was held inside due to weather, the weather cleared up for the last five flights, allowing the women to compete outdoors. At the end of the competition, gold, silver, and bronze medals were awarded to the top three athletes or teams in each division. Luther took home a total of five medals. Anna Spencer (‘21) won first place in the C-Singles division after defeating Katie Larson of Central College (6-1, 4-6, 10-6). Cory Eull (‘21) also competed in C-Singles. Eull earned third place after beating Macy Charff of Central College (6-2, 7-5), but lost to Larson (6-2, 7-5) in the semifinals. In A-Singles, Devon Bourget (‘21) was defeated in the semifinals by Isabella Hoppenjans of Coe College (6-3, 6-3). Bourget went on to take home a victory against Audrey Hinz of Loras College (6-1, 6-0). Bourget received third place and a bronze medal in the A-Singles bracket. Megan Grimm (’22) prepares to serve against Coe on Oct. 7. In B-Singles, Elissa Hemker (‘20) lost to Madison Overmann of Wartburg College (6-4, 6-4) in the semifinals. Hemker came back for a win in her match against Noely Bauman of Loras College (6-1, 6-0), which landed her in third place for the B-Singles bracket. Head Men’s and Women’s Tennis Coach Adam Strand (‘04) has always enjoyed this event for the unique opportunity that it presents for the players. Going into the tournament, the women had a record of 8-3 overall and 7-1 in conference play. 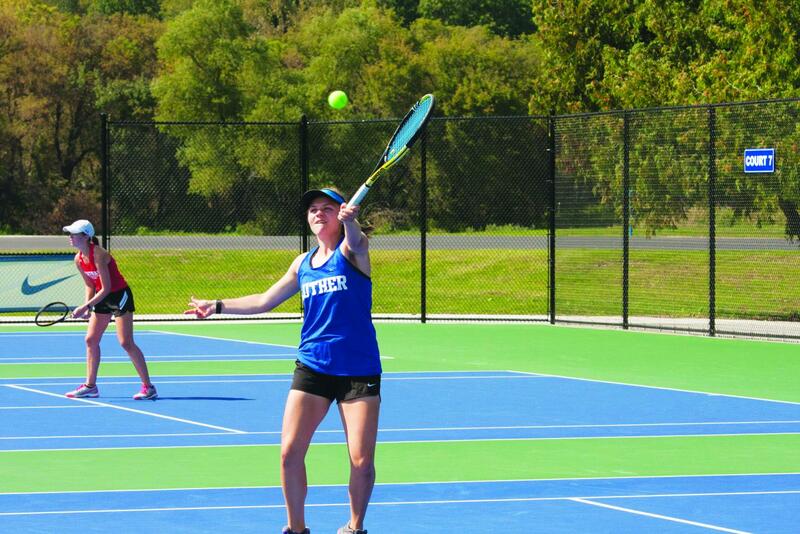 Luther’s number one singles player, Bourget, and number one doubles pair, Britta Pressler (‘19) and Shelby Cook (‘22), led the team going into the tournament. Stephanie Almquist (’21) returns a hit against Coe. Pressler talked about the importance of the team’s success. 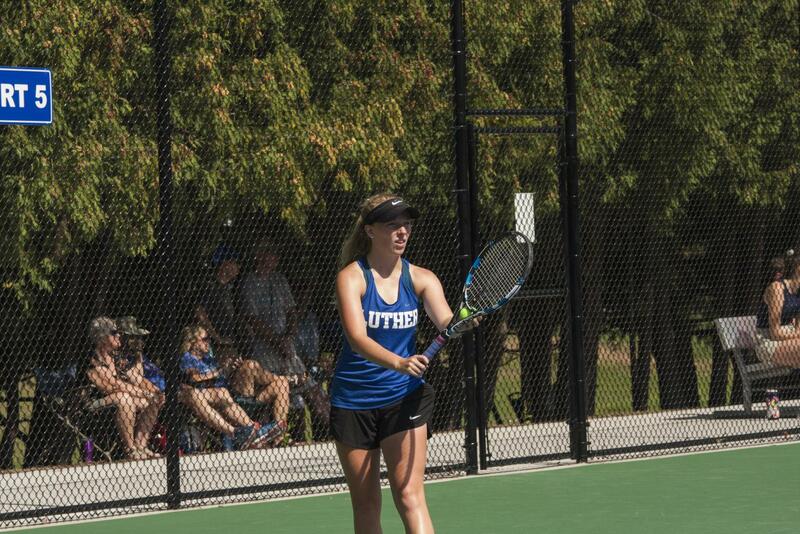 Pressler has had a successful tennis career at Luther. She has earned three varsity letters and was named all-conference in doubles two years in a row. Before this tournament, Pressler worked to help prepare her team — physically and mentally. “My favorite part about the individual tournament is seeing the progress everyone has made on the team from the start of season to the end,” Pressler said. Strand appreciated Pressler’s supportive efforts and acknowledged that supporting each other is a team-wide job. “Britta has been an amazing senior leader for us, and Kelsey Kruse (‘20) and Hemker have been strong contributors in that area as well,” Strand said. The Norse will begin off-season training in the coming weeks before competition resumes in the spring.